Each non-text question asked in the survey split out by [Main demographic], summarised in a chart and table. Useful for visualising and analysing differences between the categories in [Main demographic], question by question, in a single document. Word outputs have a chart and table per page. Excel outputs have a tab for each topic or page. Web reports are continuous. 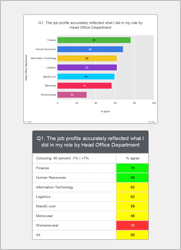 The PowerPoint and PNG formats use alternating chart and table slides for each question.